Just for you Cro and Sandie ! Is this header better ? Hello All, sorry I have been so long posting again. Hello to Angry Parsnip, on the follower bar, who has come over here from Weaver. While it has been some time since my last blog I am still strapped for time so this will be a quick post to keep in touch. 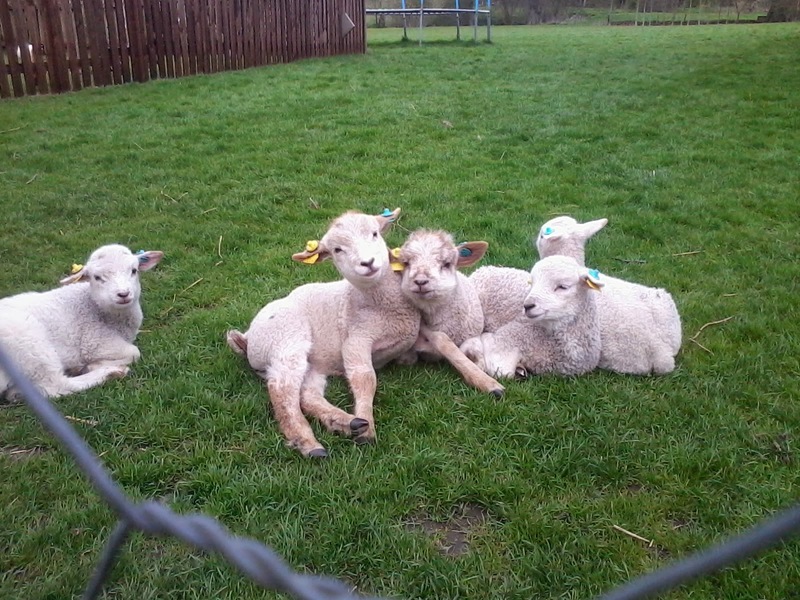 As promised here is an up to date pic of the lambs, from the left, Baaaabara, Biffy, Biscuit, Bubba and Betty. They are looking pretty strong. Good job there is a lot of grass to go at! I took a fresh pic of the pigs but it is a bit bleary, so will have another go tomorrow. And lastly here is a picture to demonstrate that being too tidy means missing out on random bits of loveliness. These "weeds" (i.e a plant out of place) on our back door step are such a joy. I am pretty sure that they are self seeded Madame de Rothchilde Violets. I'm always happy to justify my untidiness! Before I say any more I must welcome Kay, The Croods, Rambler and Forever the Adventurer on the follower bar and Andrea, Collen and Cathy on Bloglovin Great to see you here! After David and I returned from the quick fishing trip to Cornwall, (five pollack and two ling now in the freezer) staying at my oldest (!) friend, J. 's in Callington, my said friend followed us up the M5 and stayed for the week,(she returned Saturday) Whilst here she threw herself into gardening, digging the potato trenches. She dug to about 18inches then loosened the bottom of the trench and filled it in in layers - Pig muck, a sprinkling of chicken manure to activate, a layer of old grass cuttings and finally she has returned some of the soil to top. We will let this settle before we add more soil the potatoes and then more soil. As usual for us the potatoes are Sarpo Mira and I will plant them in the third week of April. Here is J. on the final trench. Not bad for woman who is 70 this year eh? The lambs go from strength to strength. It took me a few days to get Betty's eye clear and open, but it now looks nice and sparkly (as is she) They are in the field all day now, are eating hay and sheep nuts at night and go down to three bottles a day as from Wednesday... THAT won't go down well! We "weighed" the pigs today to see how they are progressing. To do this without scales you have to measure the girth and the length and make a calculation with these figures. A young friend was here as my godson and I set off with the tape measure "Why are you wearing ear defenders?" he asked"If you have ever had your ear next to a squealing pig, you would wear ear defenders" said Gdson. We decided that Gregory has the loudest squeal!. I hope you are all enjoying the build-up to the election. Such fun! We decided that we would not vote by post or email as we have always made voting a bit of a ritual and it wouldn't be the same without taking our cards round to the village hall and chatting to others doing the same. When the children were small we always took them with us and usually carried on to the local pub for a lemonade afterwards. I'm pleased to say that my children and grandchildren always exercise their right to vote. The wind is very strong today so I think I will work in the greenhouse or the hen house today. Goodness knows there is plenty to do! Just a quick one ! We are about to set off for the first Cornish fishing trip of the year. We'll be staying at our friends' in Callington while David is fishing from Looe. He is with a new skipper on a new boat this year, so we will see how that goes. Meanwhile, as ever, our youngest daughter decamps to ours until Sunday when we will return, in time for the family to join us for tea (well it IS Sunday!) She has quite a list of tasks to do this trip, with chicks, pigs and lambs on four bottles a day, not to mention the usual hens, rabbits, cat and parrot! Thank goodness that the greenhouse will look after itself for a couple of days. Thank you all for your kind comments and I await my seed from Weaver with much excitement.